As my hearing loss progresses I am being forced to understand the phenomenon that is our brain to ear relationship. Not in the medical or technical sense but simply in the way we function daily with regards to hearing. The focus for me lately has been one of bugging. Bugging? Yes, bugging. You see the modern day bug is designed to scan a frequency and identify trigger words that may deem us a threat to whatever or whomever wants to monitor us. What we don't realize is that as we walk around through life our own ears are bugging almost the entire time. How else do you explain our ability to know someone is talking about us, or the way we jerk our head into a conversation that is being had around us because we heard a word that was of interest. What about our uncanny ability to hear our name even throughout a crowded room? That actually has a scientific term, The Cocktail Party Effect. The Cocktail Party Effect is the phenomenon of being able to focus one's auditory attention on a particular stimulus while filtering out a range of other stimuli, much the same way that a party goer can focus on a single conversation in a noisy room. This effect is what allows most people to "tune into" a single voice and "tune out" all others. It may also describe a similar phenomenon that occurs when one may immediately detect words of importance originating from unattended stimuli, for instance hearing one's name in another conversation. You see our computer like minds are scanning constantly. I don't know what fuels it and while scientist vary on the reason they are united on the event. Perhaps it is that we feel like we might miss out if we drown out all background and truly focus on one thing at a time. Maybe it is simply the way our brain is designed, to monitor and survey. It could also possibly come from the way we are taught speech as children. This effect has been shown to be neurological, physical and situational. I don't know the reason and I don't stand behind one explanation or another, all I know is - I am no longer good at it. I no longer have the capability of scanning anything. The "Cocktail Party Effect" in my life consists of me working hard, very hard to stay engaged in the conversation that is being had with me. Every other piece of sound as it bounces off the walls, pings chandeliers, slides smoothly and quickly along tile floors, dances through the light or wraps around the feet of those in attendance is lost on me. Understanding what the loss of this technique looks like is difficult to explain. Scenario 1 - I consciously choose to push that noise from my processing senses but after minutes pass and my husband begins looking at me with concern in his eyes I realize something has changed. My child has been talking to me for awhile and I have had no idea. Scenario 2 - I make the decision to allow his sound to continue to pass through the processing part of my mind in which case if there was an emergency I would be able to react to it. Thus I begin the tiring task of working through the conflicting sounds to decipher both threads of noise only to find after minutes pass that I am no longer able to keep up with the conversation at hand. Scenario 3 - My mind makes the decision for me and it chooses one or the other without me knowing it. And in this setting Scenario 1 becomes scary to me because it chooses where my mind is focused most and that might not be the wisest or safest thing. And if Scenario 2 is what my minds chooses, I will find myself all of a sudden getting so frustrated that I will snap at the person who is not the primary focus of my moment. This is why as of late my life and my energy have been very frustrating. I don't know how to help others understand. My bug analogy might be the closest I can come. In a crowded room if we are having a conversation rest assured you have my full attention. And please if you are not the one talking to me a touch on the shoulder would be appreciated if you want to engage me. Calling my name may simply not be enough. Speaking a request out loud with me in the room most assuredly is not going to produce any results. I do not do this on purpose but my brain and my ear began this dance out of preservation. I wish I could still scan. I miss out on a lot and sometimes that gap can feel like a chasm with no hope of reaching the other side. It is something I have to let go of in order to succeed in things that are more important. I truly love talking and having conversation which is why I continue to push myself and train my brain to respond differently and try new things. I do think that with more time I will be more successful in this process. In fact, in about a week I am attending a formal event where there will be chandeliers, marble floors, hundreds of people talking, glasses clinking, high heels tapping, music playing and me. I have decided that I am going to soak up all of the sound and hopefully find my little ribbon of silence when I am talking one on one or in a group. Cocktail Effect or not, I plan on having meaningful conversations throughout the evening! 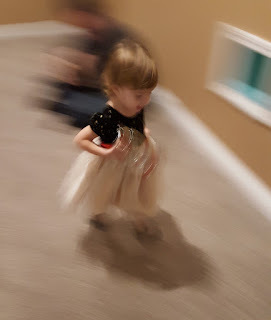 Over Christmas I captured this picture of my daughter running around in our basement. I fell in love with it immediately. There is no filter, no digital editing in fact the only change I made was to crop it slightly. The reason I like this so very much is because it embodies the sound in my house. As she moves at lightening speed through the house squealing and laughing her sound preceding and following her throughout. In this picture you can almost see the sounds in the blur. The natural essence of a child playing and it is almost in view, just about clear, almost certainly recognizable but simply not sharp or clear yet still very beautiful. This is how I look at my ability to hear. Almost in view, just about clear, almost certainly recognizable but simply not sharp or clear but beautiful in its own right because of the lessons I learn from the struggle. Journeying on in continuation of my last post...Upon the frustrating realization that my hearing was not even up to my low standards I knew it was time to see the specialist again. Grudgingly, I jumped through the insurance hoops and called to make my appointment with the incredibly busy Doctor who typically had a 6 month wait. That day God had his hand on my call as I was able to get in on a cancellation that week. It's a dream I told myself as I sat in the hearing room chair not being able to understand one word the audiologist was saying to me. The earbud was securely in my ear and she was speaking but the comprehension was gone. What in the hell was happening to me? The anger pulsed through and my heart began to race a bit as I shook my head at word after word that made no sense. After about the fourth or fifth one she paused. The silence and the waiting spoke volumes. Then unexpectedly the headphones clicked off and she entered the room her eyes meeting mine. I am sorry her face and body seemed to say before she uttered a word. She then explained that she would have to find a man's voice to read me the words and for now we would start with the beeps. I nodded and took a deep breath. This wasn't something new I reassured myself. After all, my home life had foretold that there was an issue. English speaking people were not speaking French right...but even still as it always was in this arena, I knew and yet I didn't want to believe. She returned to her room and slowly the beeps began. I wasn't sure how many I missed, I never am. I cannot differentiate between my ringing and her ringing most of the time. There was however another new disturbing trend becoming obvious as I listened, my left ear was not hearing the beeps as well as the right. Up until this point with every test I have taken both ears pretty much operated in the same manner. But now, it seemed that a greater shift was taking place in the left. Finally the beeps were finished and she indicated that we would return to the frustrating task of me being able to have a conversation. She put on a tape of a male voice saying the same words she uttered earlier in the session. This time I could comprehend some of them but still not all. It was apparent that she still was not satisfied with my responses because she asked me to take out the ear plugs, put in my hearing aids and face the large black speaker in the room. I then listened to the male voice again with both ears, very loudly and I repeated back what was said to me as best I could. I was released then, blessed freedom from that very small confining room. She moved me into the patient area and there I waited quietly on the Doctor. Once he joined me he checked out my ears, my chart and then held it up for me to see. Part of the problem he said was that the hearing aids I have may not be adequate for my ears. He began explaining that I may need to switch the end of them to something a little different. He also confirmed that my left ear had significantly fallen more dramatically than the right. It is important to note that they offer no explanation. They never do. In actuality there is no sympathy or concern. I am not going to die, I do not feel bad, for all purposes this is more of a cosmetic issue. Like deteriorating eyesight. Those of you with glasses understand that when you go get your eyes checked the Ophthalmologist doesn't act concerned as your eyesight worsens because it is expected that once it starts to go it will continue getting worse and worse. In all my eye appointments I have never had anyone offer me an explanation as to why my eyesight is so bad or comfort me because of it. In this way, they approach my ears the same. They act as if I should just know they are going to get worse and it is just a fact. That is why when he delivered the next bit of news he did so with as much compassion as a professor pointing to a hypothetical patient chart. The culprit of my not being able to understand speech well was that I had lost another sound. He pointed to the three "above ground sounds" so to speak from last appointment and then to the dots that appeared this time. Only two remained above the threshold line. I am fairly certain my breath caught in that moment. In fact, more than even that dramatic motion I held that very breath for what seemed like an eternity. My mind began to call out to the dying follicles, my faltering ears...where are you taking me now?? So I will try and explain this. You see my hearing has always been a partial loss, meaning that my high sounds have fallen well below what is considered normal but there were three low sounds still holding on in normal range. Essentially, I did not need a hearing aid to help me in those areas, only the high notes. And so my hearing aids had holes in them that allowed those sounds to occur in my ear naturally while helping me focus on the missing ones. Brilliant really, the technology is so amazing. But over the last two years one of my three good sounds dropped down to well below normal in both ears. Essentially I lost it. Another sound gone leaving me with just two low sounds that I can hear on my own. It was really sticking in my gut this time. The fear and uncertainty unnerving me and pointing their bright red arrow at the notion that there was no escaping this. The Dr. assured me there was a quick fix for this problem to help my understanding and everyday life. The new hearing aid I mentioned would be enclosed so that those two sounds, my last two sounds I heard on my own would be blocked. The trade off, my understanding would increase. Essentially, I could no longer rely on any of the hearing that I have naturally. Two years and another sound gone. Questions circled stubbornly in my mind. Will it be four years and then all my notes will below normal? Do I even have that much time? What happens after that? Why isn't there an explanation? I asked the Dr. about a place I could learn sign language. He said, "Oh, you won't ever need that. We will always be able to help you hear with technology." I don't understand that. How will I be able to hear when all of my hearing follicles die? I cling to it anyways. The hope that in some manner sound will always find its way into my mind. Later in the week my dad passed along an article from KU Med Center talking about how they have had success in re-growing the tiny hair follicles that control our ability to hear. They are currently in the testing phase and it is very promising research. Right now they are testing on fully deaf patients and the initial results are very encouraging. I do not know if that will even be an option for me because they do not have a reason that my hairs have died and continue to die, they just are. And even if they can regrow them, what is to say that my body won't kill them off once again? So for now I stay on the course as God has given it to me. I will use my hearing aids until they no longer work and when the time comes I will switch to a cochlear implant. The time table is not mine to hold or my burden to bear. So while in truth another sound is gone, I am not the cause and there are no preventative measures. In those words I find freedom. At the end of 2015 and beginning of 2016 I still remain grateful. This year has tried to work me over and in some areas I have struggled greatly. I continue to trust in God's plan for my life, seeking him first, putting my hope, heart and hearing in his hands because that is all I can do as the sounds slip away one by one. I knew my hearing was getting worse again when during The Voice, I turned to my husband and said: "Tell me they are singing in French." To which he replied, "No, no they are not." "Breathe." I remember whispering to myself. It is a feeling unlike any that I can truly describe to not be able to decipher what someone is saying. You hear the sounds, you know that they should be making sense but nothing that you try makes them do so. Even knowing that I have a hearing problem my first initial thought leaves me pondering other issues. Am I stupid? Am I losing my mind? Why can't I figure this out? I don't know how much cognitive energy I use during one of these moments but it has to be quite a bit. It feels like when you have forgotten something and you are trying really really hard to remember but instead of letting it go after a few seconds your mind continues on and on completely baffled and desperately searching for the answer. "Breathe." I can almost see the little magnifying glass moving in a circular motion in my head, searching...searching...still searching...and then the dreaded "No results found" message. At that point my brain begins to think of another way to ask the same question in an attempt to get an answer. In this cycle it will continue for as long as I allow it. To end this I must remove my self from the situation, admit that I am never going to decipher what is being said or find another way to communicate. "Breathe." I don't know about all of you, but when I can't do something on my own I tend to feel anxious and a bit afraid. With words, something so basic and easy, it drives even deeper and pushes on a few nerves you probably never even knew you had. The lack of comprehension makes me feel stupid, annoyed, anxious, afraid, useless, out of control and humbled. It is a cocktail of emotions that rushes in during a very intense moment and I have seconds to decide how to handle their weight. "Breathe." A lot of times my surroundings will dictate just exactly how that moment will take shape. With those I love the most I may show frustration and sadness but to others I may just appear flustered and confused. It is important to note that I am just speaking for me personally, not everyone with hard of hearing probably feels the same but for me, this is it. I cannot stand it when my speech comprehension goes away. "Breathe." It is a cocktail of emotions that rushes in during a very intense moment and I have seconds to decide how to handle their weight. This is just one example in my home life of how these emotions work through me during a normal conversation with Chase. Stupid - As my four year old repeats and repeats and repeats for his mother I want to scream at the top of my lungs in desperation. Annoyed - Not because I am in anyway angry at him but I am in complete submission to the moment. Anxious - He cannot write, he cannot text, we cannot sign and he barely has the cognitive ability to rephrase what he is saying in hopes that different words will allow me to understand. Afraid - What if this is a medical issue and I cannot decipher something. Useless & Out of Control - When I am the only one home I just have to tell him how very sorry I am that I cannot understand. Humbled - In the moment he realizes that I just don't know what he is saying and probably won't figure it out. "Breathe." It is a cocktail of emotions that rushes in during a very intense moment and I have seconds to decide how I will handle their weight. But that moment isn't really the key. That struggle isn't really truth. That out pouring is human and necessary but doesn't have to define you. It's the amazing breaths that take place without hesitation after those emotions flood in and out that really matters the most. Breathe and choose to know that this is nothing you cannot overcome. Breathe and choose to see that this is not the end of the world. Breathe and choose to believe that better things are yet to come. Breathe and choose to draw strength in the fact that this is not your battle to fight alone. Breathe and choose to stand back up renewed. Breathe and choose to continue to fight. Living with a chronic problem that currently does not have a cure I am learning things daily. Especially that your day to day struggles cannot control you and pretending they don't exist isn't healthy either. Authentic living requires that this issue has to be accepted as part of me. But in that, there has to be a healthy balance. While it does not have to define me or restrict me, I must acknowledge and respect it. Our emotions are there for and serve a great purpose. Do not be ashamed in your bad day, in your crying, in your sadness. Do not stuff your feelings back or away. Instead allow them to see the light and deflate them in their very essence by doing what they try to tell you that you can't. "Breathe." I couldn't sleep. This had never happened to me before. Over and over my mind kept asking, "How would I run this race if I couldn't get any sleep?". Nerves were settling in hard and I knew that if I stayed up too long I might not follow through. Four months of training and pushing myself would be all for nothing. Fear after fear and one negative picture after another plagued my thoughts but fear of what? I could not identify it. I wasn't afraid of not finishing, I was confident in my endurance that no matter the time, the race would be completed. I wasn't afraid of the route as I had mapped it out just a couple days before so that I would have an idea of what to expect. What then kept me from drifting off into a much needed rest? I believe it was a mix of anticipation and adrenaline. Because of the how far away the race was we had to get up at 4:30am. A time that was growing rapidly closer on the digital red numbers that glared at me mockingly. Finally around 2:30am my body and my mind were at peace. Swim, massive amounts of people jump into the water and fight for their place to move. One loop around, just like at practice. Once on sand the swim cap and goggles would come off as I traveled to the transition place. There I would quickly dry, put socks and shoes on and jump on the bike. Bike, hill after hill and multiple car laden roads would take me on a trek not with any type of trail destination ahead. All small town roads some without curbs would be my path. Run, this was a trail run and the shaded areas would be most welcomed. I would add my runners belt on after I dismounted and eat my Gatorade chews as I ran. Importantly, after training without music I did decide to wear my hearing aids. I had them tucked safely in my runner's belt for me to put in after the swim. And then it was time. I remember standing on the sand with my number written on my arm and my age on my leg full of nervous energy but invigorated from the excitement. I was all alone yet surrounded by hundreds that were united by a similar goal. We lined up in front of the water and then it began. Swim: I was kicked, punched and pushed in the water but nothing bad enough to stop my forward momentum. I pressed on to get out ahead and away from the masses. When I exited the water my family stood cheering me on with homemade signs and I waved warmly. Transition 1: I dropped my hearing aid. I guess that should have been anticipated. They are small and I was in a hurry. I found it quickly though and was off on the bike. Bike: So many people passed me on the bike. Even with my new road bike I could not keep up with their speed and leg strength. I put up a respectable time but could tell I had a lot to learn in this area with regards to technique. Transition 2: Jello legs. They were always present after dismounting the bike. Most of the time in training I would just give up after a mile and call it good. But today I knew that was not going to be enough. Run: Surprisingly I picked up my race in this area. The jello legs faded about 1.5 miles in. My only goal was no matter how tired I was that I would not stop running. No, walking. I held true to that even when I wanted to quit I would look ahead to those in front of me. Age 50,45, 23....and think, I can keep going. Finish line: I could see it. I got a surge of energy and sprinted to it. I vaguely heard the announcer say my name and comment how I still had some fuel on the back end and was finishing strong. A smile broke out on my face. It was done, I had completed it and the most important part - I loved it. 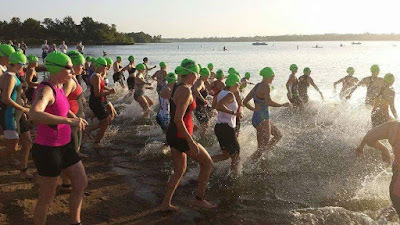 When I would talk about running a Triathlon the most popular response was, "I can't swim". Their body language would instantly tense and the words would be spoken with their head shaking, eyes wide and a tiny hint of fear. This consistent response confused me. I truly never knew that so many people are not comfortable in the water. A glance at any city pool would seem to prove the opposite but in this case my experience showed a different side. It was such a frequent statement that part of me started to wonder if I should feel the same. Herd mentality right? However nothing about the water, other than sharks, scares me. In fact, this was the part I felt suited me most. So with each fearful swimming declaration I would respond, I love to swim and shrug my shoulders. I began my swimming journey in our small subdivision pool. I would squeeze in a swim wherever my schedule would allow even if it was just 15 or 20 minutes. To be fully prepared I carried my swimsuit around in my car. The size of our the pool was not ideal and became a bit of an issue. It felt like I was a goldfish in a small bowl swimming circles around the edge headed somewhere but going nowhere. In complete contrast to the bike everything about the swim was predictable. Over 50 laps back and forth, the turns so frequent that I would feel dizzy as I was swimming. It was in one of those moments that my hearing finally became something I should consider on this journey. I began to wonder if the dizziness was from more than just the size of the pool. Each time I would exit the water my ears would ache slightly from the pressure and I would shake quite a bit of water out of them. I hadn't even considered if I would even have my hearing aids with me during the race. You see, up until that point my training had been for an imaginary goal. I had not signed up for a Triathlon or even researched how the race worked, I just simply started to train. Faith sometimes is funny like that. I just did what I felt I was being called to do and the plans were nowhere in sight. 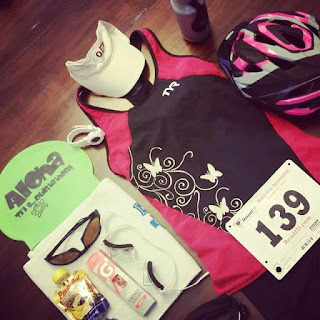 When I found my Triathlon I quickly realized some of my assumptions were wrong. The first being that headphones in a Triathlon are not permitted. OK, all of my bike and running training had been done listening to music or words on my earbuds. When I read that in the Triathlon rules I was almost going to give up. Silly huh? I am dizzy after a swim and I press on. I find out I can't wear headphones and I think, oh OK this isn't for me. I am sure by now everyone understands just how important music is in my life. One of the things I like most about exercise is the rhythm of the music as I move. As a former dancer, music and working out go hand in hand. When I read that the reason behind it was for cycling safety I started to wonder if I should be wearing my hearing aids in order to hear passing cars before they approach. During that week I began riding and running without music with my hearing aids in. I also went and purchased ear plugs for the water which made a large difference in the dizziness. The size of the pool it seemed was not to blame. Since I knew this race would not be in a beautiful pool but rather, a murky lake with no sides on which to rest when needed. A friend suggested that I should start practicing in a lake during a special time set aside for triathlon runners. Luckily several of our local lakes offered those options and so I set out one evening on an adventure. The whole family came with and my hubby and kids played on the playground while I gave this lake thing a try. This my friends was a pretty funny sight. I showed up in my one piece "granny suit" as Chris calls it. I wore my bright green kid goggles that are scratched an in need of repair along with my very obviously bought in a store swim cap. To say I look like a novice would be being kind. I appeared to be quite aptly, a fish out of water. Summing up the area I saw 90% triathlon suits and multiple people in training groups. The other 10% were men in well rather small swim suits. Embarrassingly I had to ask the life guard what I was supposed to do. She pointed to the far buoy on the right hand corner of the lake and then the equally as far buoy on the left side of the lake. That, she said, was my path. I waded in the water nervously keeping my eyes fixed ahead. Then, when I could stand it no longer, I looked back to the playground where my family was. I longed for their protection and security. Words of affirmation would have been richly welcomed. This was shaping up to be a very humbling affair. It has to be done. It has to be done. I told myself over and over. Just go for it my subconscious breathed. And so, I did. Diving in I began to swim without much site or planning. Every so often I would stop and doggy paddle in order to make sure I was on the right path. This wasn't about timing for me this was about practice and pushing boundaries. Much like the bike path I enjoyed the swim way more than I expected. Yes, I was swimming towards a goal but the sand between my toes was only one of the perks. Much deeper even then the lake was my repeated need to do things never done before. As I exited the water I felt strong and good. This was right. It all felt so right. I liked that. I would practice the swim only three more times in the lake before race day. Each time I felt more comfortable in the water and my time improved. I no longer needed to glance back to my family before I waded in. I would attack the water with force and determination. Diving through it all, keeping my eyes fixed on the first buoy and then the next. One punch at a time building my endurance physically and mentally. 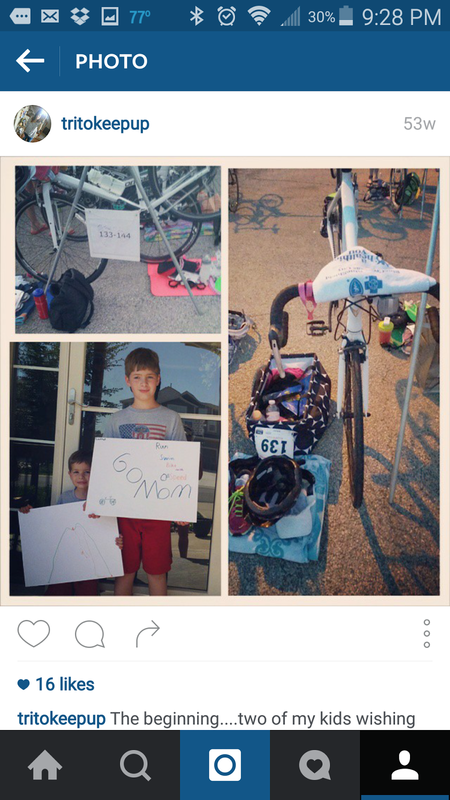 *During this time, after I finally committed to a race, I purchased a road bike, triathlon suit and runners belt. I did not get the top of the line in any of it but all of those items were needed and I felt that practicing with them would be helpful. I am not sure what the "natural" response to dealing with a situation that is beyond your control should be, but for me it was to find something that could be managed. You see in the face of my hearing loss I had allowed small, seemingly insignificant doubts and fears to control my actions. Being forced to acknowledge my limitations hurt my independence and began to drive a need in me to prove that I could rise above and become more than what I was at that very moment. In essence, I needed a fight. What? 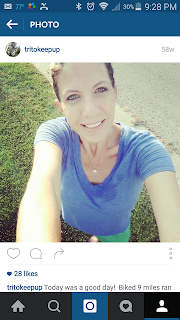 I recently blogged about passive peace right? Ha! Exactly. But the truth is the truth and I could feel that old familiar feeling welling up inside threatening to erupt if ignored. I instinctively knew that my opponent had to be something that would really challenge me physically. It also had to be a pass or fail so I would have no choice but to commit 100%. An "all in" or "take up the cause" mentality was what I craved. The adversary I chose was a Triathlon. This is that story, condensed and aptly divided into three sections. 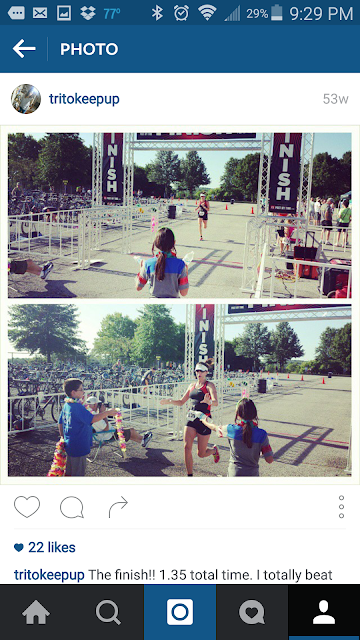 I hate to say that I just woke up one day and decided I would run a triathlon but that is exactly how it happened. I was sitting in Caitlyn's room nursing her in the wee hours of the morning and relishing the complete peacefulness of the house. I was calm and happy. What happened to that sweet serenity? How is it that moments are stolen by dissatisfaction and self doubt? Perhaps you all have been in my place before. Maybe you understand more than I know the power of that distorted looking glass as it stares back at you not only revealing but accentuating all of your most embarrassing flaws. I began to think about my baby weight with great frustration. About 9 months in was always the hardest time for me after having my babies. It just seemed like for all a mom's effort and care that she takes carrying and birthing a baby it should only be fair that we are reciprocated on the back end of that journey by losing weight easily. Truth be told, I was mainly frustrated that I did not have time to workout and that even if I did there was so much guilt attached to it that it was not enjoyable. Cartoon bubbles of 5K options began circling my head but I dismissed them as too easy. I believed I knew that training for such a short distance was not necessary for me as long as I didn't care about my race completion time. I honestly didn't even think about marathon or half marathon because while I enjoy running, something about those distances just didn't appeal to me. I remember thinking that I loved to swim and then the idea was just there. No, I had never biked before. No, I didn't even own a road bike, helmet, water bottle, etc. No, I didn't own goggles or a triathlon suit. No, I didn't belong to a gym, community center or fitness group of any kind. I only had me, a mountain bike and the very small pool at our subdivision. What I was armed with was my S5 phone that had the new S-Health application and more determination than I had felt in a very long time. 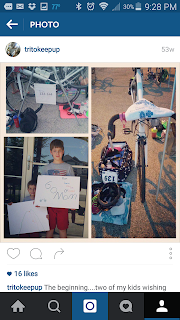 I began my mental journey on Instagram with the user handle tritokeepup This allowed me to hashtag items that would then connect me with other triathletes in training. Watching their journey helped motivate me on mine. I started the physical part that very next Monday. I used what I had, a mountain bike. Slowly at first with one mile, two, five and then ten. It became rapidly apparent that biking suited me as I looked forward to it and was excited by it. I would also pass cyclists in my car and feel happiness for them and for my next upcoming ride. Something about feeling the wind on my face during a sweltering day invigorated me. My most favorite route was a regular 12 mile course that took me down car driven roads to a bike trail. It is important here to focus on the word TRAIL. You see, this became the focus of my ride - the destination, the inspiration. I would anticipate and look forward to the trail from the second I pedaled out of my driveway. In fact, the entire distance to the entrance filled me with an unexplained excitement and joy. Right before the entrance appeared I would cross a busy four lane road, hit an expected bump where the sidewalk was just slightly too high and cross a bridge overlooking a train. Then there it would be. Instantly I would be covered by the overhanging shaded greenery of the trees creating a sun dusted path full of twists and turns. Along the trail nature would reach out in all its glory, the trail bending and weaving with the earth. Deep in the fabric of the ride there were two hills that always beat me yet I still loved the path. Even knowing they were coming did not ever dampen my joy. Two hills always beat me yet I still loved the path. There was a lesson hidden here, I am sure of it...and then there it was: Things like my hearing will always beat me, I am unable to correct it or change it yet I still love my path, my life. Now, back to those hills, they were steep my friends and I am afraid of heights. But this journey wasn't about being held back. No, this was about being pushed forward again and again into an unknown outcome with an unexplained peace. And so, going up I would pedal hard and fast getting as far as I could before having to dismount and walk. Going down in parallel to the incline I would walk slowly down beside my bike until I reached a comfortable distance in which I feel safe riding down. Importantly, with each bike ride that spot rose and my comfort level increased. I never did make it to the top of either one hill but every time I rode, I was beating something. My previous ride, expectations, responsibilities, fears and much more. I found that I was growing not only in physical strength but also in character, just by taking a few minutes to take care of me. Not really a popular subject with mothers...taking care of themselves. In fact, that thought holds such a negative connotation by so many that women are often unfairly judged and held to an unhealthy standard. This was the other reason that running a triathlon came to mind when I was thinking about losing weight and taking time for myself. Because if I was going to take time away from my family it had to have value in order for me to avoid that guilt. After about a month of consistent biking I added a short run afterwards. But, lacking mental endurance I never really made it more than a mile with my jello legs. And so, biking 12 and running 1 (or less) miles became my regular workout. I was surprised that even with that large dose of exercise I did not lose any weight. I was even more surprised to realize that this journey had nothing to do with that motivation at all. It was a drive born out of the peace and acceptance of my hearing loss. That even if I never beat those hills I would not give up the fight. My brokenness brought me to that place in Caitlyn's room. The spot where I woke up and decided that win or lose I needed a fight.